So my teacher started the explanation of Chemical Equilibrium saying.. The concentration does not change with time. And, gave us certain graphs asking which ones show chemical equilibrium. I cannot understand what's written in my copy since I took the lesson two years ago. I need to be explained what I wrote in my copy. I know that the concentration does not change with time. If concentration is same or not, does not matter. That only the rate of forward reaction and the rate of backward reaction needs to be same. The concentration of the reactant is lost but same amount is achieved by the product.So here, the rate of forward reaction and rate of backward reaction is same. For 5 and 6- The concentration of reactant and product may not be the same but it does not change with time. 1.Explanation as to how the other graphs do not show chemical equilibrium(if possible in terms of how the answer for the other graphs are explained). 2.Explanation for graph 5 and 6. I cannot understand the reason I had written. 3.An overall explanation and answer of the question. Thank you very much for your help and understanding!! Firstly, you need to understand what it means when a system is in equilibrium. Equilibrium is the state of a system where the rate of the forward and reverse reaction are equal. Note: this doesn't mean that the reaction completely stops, all this means that the concentration of the reactants and products remain constant. A simple example of this can be shown in an experiment where a cube of sugar is placed in a saturated solution of sugar. If you leave it for a few days and come back, you will find that the shape of the sugar cube has changed. Instead of being a smooth, perfect cube, it is a irregular shape. However when if weigh the solid sugar, you find that it will weight exactly the same as the original sugar cube. Now this can be explained by the fact that the solid sugar is in equilibrium with the dissolved sugar in the saturated solution. Despite the forward and reverse reaction being equal (as no more sugar will dissolve) the reaction is still occurring. At a microscopic level, glucose molecules in the sugar cube are dissolving into the solution while dissolved sugar molecules precipitate out onto the sugar cube. However where they precipitate on the cube is random, hence they don't form a perfect cube. This is why the sugar cube changes shape but has the same original mass. 7: In this graph, the concentration of the products is increasing while the concentration of the reactants is decreasing. Hence the forward reaction must be greater than the backward reaction. Therefore, the system isn't in equilibrium. Is the concentration of the products and the reactants constant over time? if they are constant, the system is equilibrium. Note, the concentration of the products and reactants don't have to be equal. If concentration of the product and reactants are aren't constant, the system isn't in equilibrium. 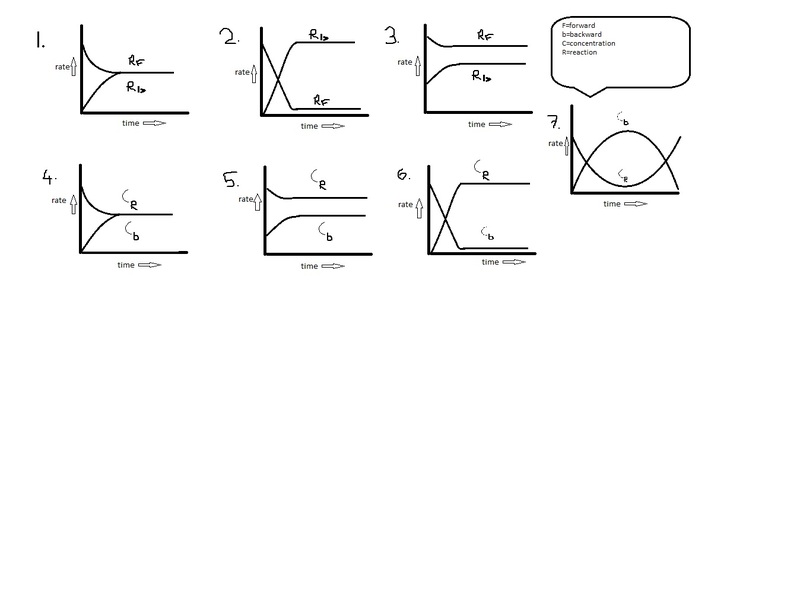 Which diagram shows the effect of catalysis on chemical equilibrium? Is reactant concentration = product concentration at equilbrium? Is a discharged battery in a state of chemical equilibrium?